It’s all about the Dragon! So her she is in all her final glory. Pattern is by King Cole number 9051. 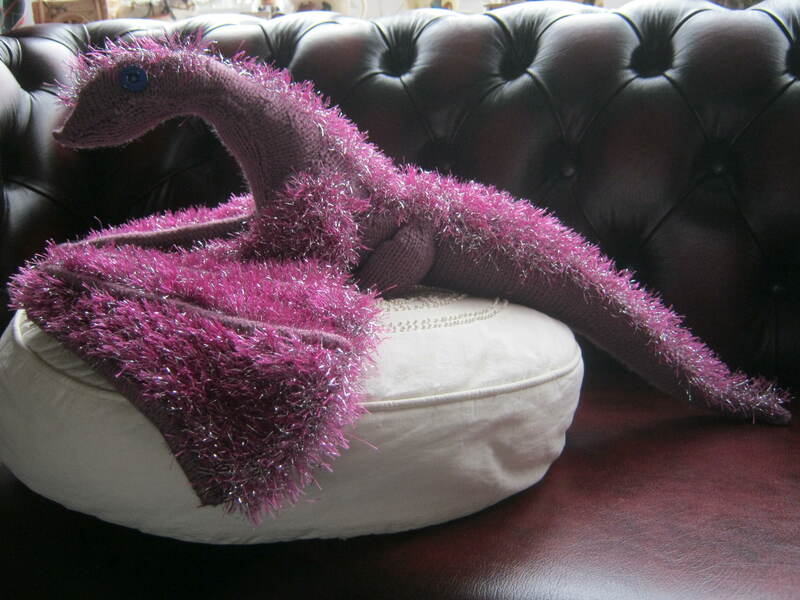 Yarn is King Cole Tinsel and Stylecraft DK Colour Grape. Her final length is 25 inches and wing span tip to tip is 26 inches. And as for her name, well she quite likes the sound of Belinda , what do you reckon? 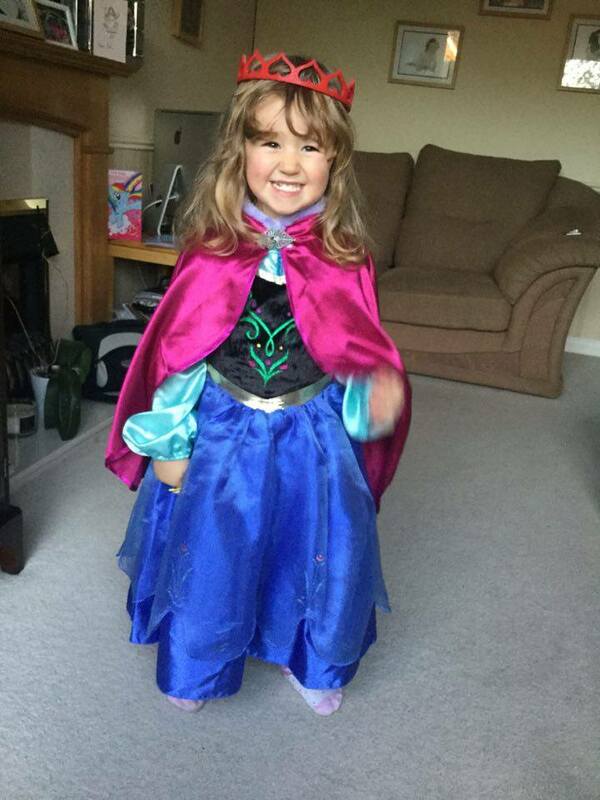 I expect Little Miss F being a Princess with attitude will have quite her own views on the matter of names. She isn’t waiting for a Prince to rescue her! Linking with Ginny for Ginx Woolly Linz party. Do have a look over there. Now I believe I have an Attic 24 weekend bag to finish crocheting. PS Does anyone watch Death in Paradise, I can’t help feeling that the dragon’s face looks just like Harry the lizard. This has been such a busy month for us with one thing and another. Far too much time spent on hospital appointments, garages and dentists, but these things have to be done. The TV was safely delivered last Saturday, it does seem enormous to me and it is still a novelty to push the on button and a picture comes up straightaway. The last one was taking ten goes to get it to start, and it wasn’t a faulty remote control in case you were wondering. I was able to spend the last hour in the Kirkbymoorside Repair cafe. I gather it had been a very slow day for everyone, which was just as well as not many repairers had been able to attend. A lady from a nearby town had visited having heard of the venture and is very keen to set up one in her community, so that was a big positive for everyone. 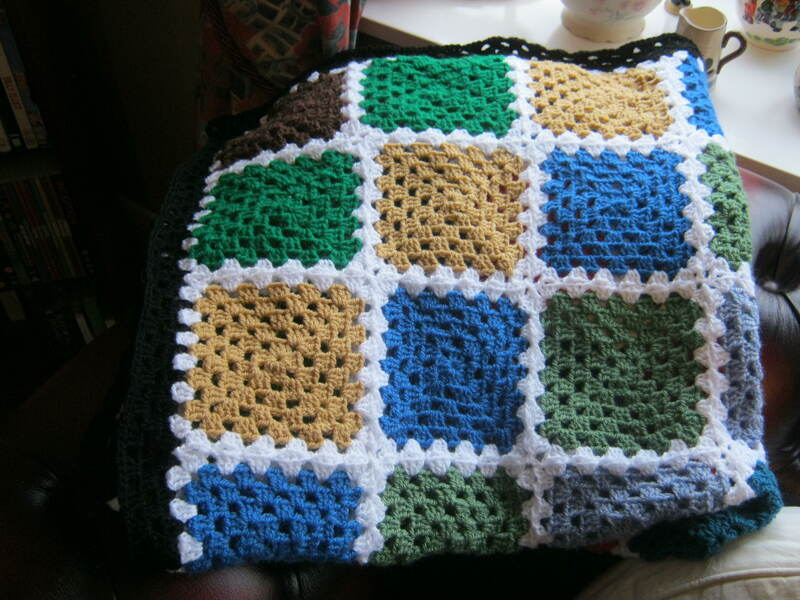 I have finished sewing in the ends and adding a black border on the crochet blanket which is to be a raffle prize for the cafe. 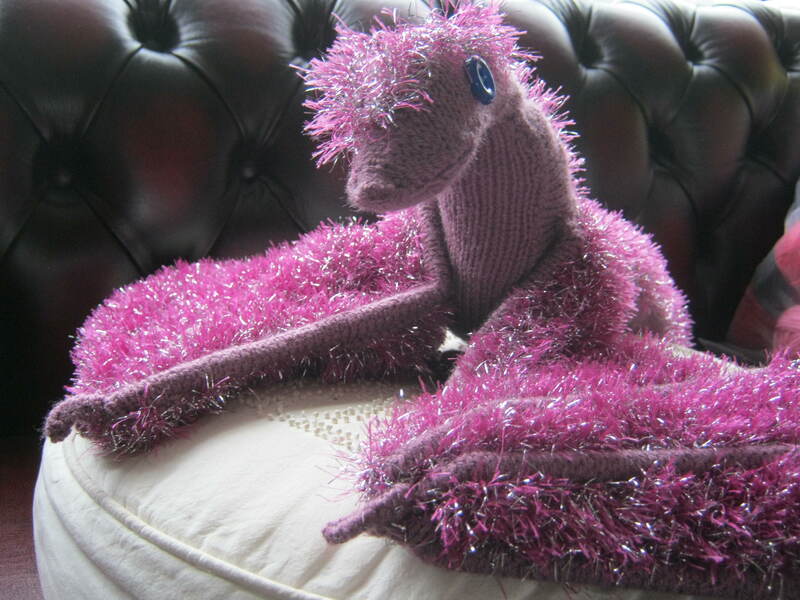 I was thrilled that so many people could see the dragon emerging from my knitting last week. I am still working on the same wing, so not much to show this week. 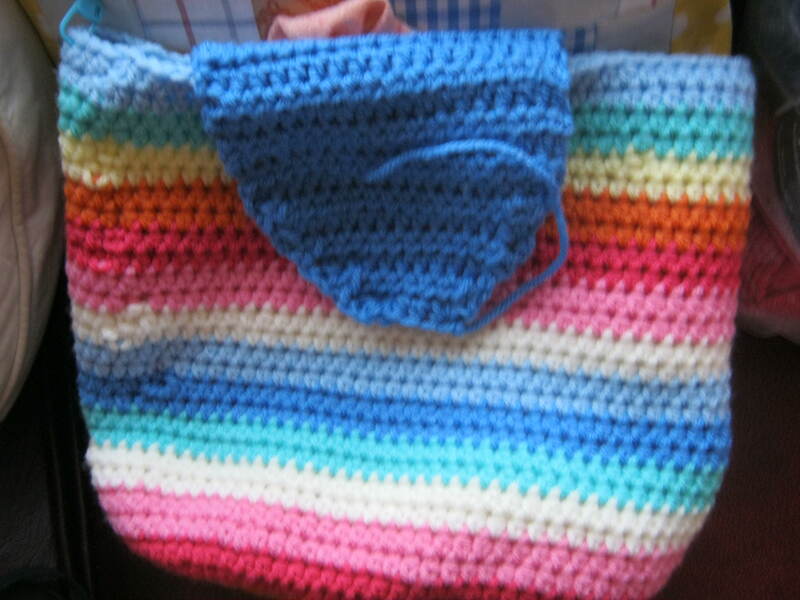 I have been able to do some more crochet on the Attic 24 weekend bag, which look bigger now I have done more, but I can’t help feeling there is going to be an awful lot of leftover yarn. Hoping that when I sew in the ends I can get rid of the joins which look awful to my mind. The instructions said to join on alternative sides and in a different place each time to avoid a seam. I think I would rather have a seam than a mess. Must be me and my poor crochet skills! So we are at the end of a month and I am quite surprised that I have managed to go a whole month and not buy a scrap of yarn, or a book or fabric. Nothing, zilch in the craft buying department, not even a button or a piece of tape or even glue. Have I turned over a new leaf? I doubt it!! I am hoping that February will be a quieter month and so have more crafting time. What about the weekend, do you have anything exciting lined up, was January filled with craftiness? How is your stash? This weekend for me, tomorrow is Holocaust Memorial Day and I am participating in an event in the library, I shall be doing a couple of readings. Sunday is the day I shall do my bird count for the RSPB. According to the pet shop where I get my bird food people have been buying lots of bird food this week in anticipation. We shall have the fattest sparrows and pigeons you ever did see I reckon. Still very good that so many people want to join in and care for our feathered friends. So over to you now, please join in with the natter wherever you like in the comments. The natter is what makes these Friday posts. I started these Knit and Natter posts last year when Ginny of Small Things gave up her Yarn Alongs. Turns out she missed them too, and she has re-started them as monthly link ups rather than weekly ones,here . Which is a jolly good thing, but you haven’t got rid of my Friday ramblings as easy as that. I have got far too fond of my own voice, more than that I have got very fond of the Natter that always follows. My Fridays would not be the same without our chats. My son phoned this week to talk over a work problem. I listened, I spoke calmly, but what I really wanted to do was say ” who is this person causing you grief, I will TELL them!” Which of course would do no good. We are often told in the UK we have low productivity. It seems to me that if people spent less time on office politics and more time doing the job they were paid to do , the world would spin a lot faster, why one wants the world to spin faster I don’t know. ( Alice in Wonderland I believe). Isn’t it so hard when your adult children have problems? Meantime the great tidy up after Christmas has begun. Just where do all the spiders live that spin so many webs in the house? Maybe it’s just me they have it in for? Hasn’t it been lovely to see everyone writing on their blogs this week with posts about the last years highs and lows and aspirations for 2018. I so hope to stop adding to my collection of yarn and fabric and get on and work with it. Oh, and clean the oven, January’s only goal for me. Yes it does need a clean. And I actually quite like cleaning the oven, all that gunk is so satisfying. Today I will do this. I have been mostly crocheting this week, trying to add one block a night to the final rounds on the blanket destined for a care home. I have 14 more to go, so in two weeks they should be done and ready to join and add the border. Maybe finish blanket should be another goal for January. That makes two. I have started with the Jo Baker book on my January reads. Hey that makes three goals, to finish this book. Before I know it there will be 18 of the beggars. Not only has Ginny missed her yarn along but so also has Ginny at Ginx Craft who has started a first Monday in the month link up. Ginny designs and knits the most wonderful things you can imagine, there is talk of a book, I will pre-order it if I am allowed. I have done a little knitting on the mystery project, no-one hazarded a guess last week , and this week is no better I reckon. It will grow, once the blanket is done. Maybe by the end of January, oh my could that be four goals for January? Enough, I shall go and clean the oven. Do please tell what you are making, could be anything, a bird house, a widget, a jumper, a blanket, a picture, a cake.. I shall be making greasy gunk this morning! Two trips to the theatre in the last week, both were very enjoyable. Turns out plays are just like buses. That will be it for months. Jill at Nice Piece of work wrote a lovely post this week in which she said it was good to be thankful but it was beneficial to have something to look forward too. And she is so right. If you are having a tough day/week/month/year(s) as I have had in the past, (fortunately I am enjoying a quiet year worry wise in 2017 )then it really helps to focus on something to look forward too. Christmas is nearly upon us, no good kidding myself that I am going to knit three jumpers, 10 scarves and an elephant in time to post them ( wasn’t actually but artistic licence and all that). Christmas for many of us is a joyous occasion, but bad things happen at Christmas, I have done hospital visiting on Christmas day, so I speak from experience, and there are our memories of people and Christmases past too. So I reckon having something to look forward too is a jolly good idea. So have you something to look forward to? I am off at the start of December to stay with my brother and visit my Mum in Wales. The weekend after that young Mr B and Ms G his partner are coming up to and DRUM ROLL, clear out his bedroom which he has not slept in for nigh on 10 years. I don’t mind things going in the loft or having to take stuff to the charity shop , but it’s time t-shirts I bought him aged 15 went! And Buzz Lightyear, and cds of Marilyn Manson, and replica football kits going back to the first when he was 7. I have been very, very patient over this. I now have stuff from Mum’s house and my Dads and my FILs and I am in danger of looking like a mad hoarding type of person. There is stuff everywhere. Jan at the Snail of Happiness wrote an equally interesting post about someone who had pared his belongings down to 111 things. He said he didn’t have a storage unit, but I noted he said nothing about his parents house and his old bedroom. It’s terribly hard to move your children out. Part of me loves having his things occupying one bedroom, but part of me thinks it’s time he dealt with the stuff. My Mum had no such problems with me, when we got married and started to buy our first home, age 21, she just packed up all my belongings and put them on a removal van. What finally prompted Mr B to come was when I told him we would be bringing a load of stuff down to him, he doesn’t want that! I really like the centre square of your blanket. I like the buttermilk on the white background much more than when you team it with the orange – I think the orange is my least favourite colour here. Do you see how the colours become brighter when paired with the white, but when placed together they tend to become dull and heavy? It’s because they are all the same tone weight – which means there’s no light and shade to lift and move the eye across the pattern. Having lighter colours beside deeper shades makes it more interesting for our eyes. The orange, green and mustard are your same tone colours. Change any one of those up with a lighter brighter version of the same colour and magic will happen – or just insert a row of white between those colours and see what happens….. Or you could just choose your favourite colour and make the final squares and edge it all up in that same colour. So now I have orange (Stylecraft call it Spice) and Cream together to brighten up the green, and mustard and grey with the Marigold block to dampen it down a bit. After that I will just do a DC border in the various yarns. Never before has a blanket caused so much hassle. Thanks to everyone for you help and support. In future I will think about colour and tone! Now all I have to do is crochet 14 blocks of each square. Meantime Secret Santa has been hard at work. one of Bekki’s Santa Sacks to go in it, which will be filled with all manner of good things. I went to a rather nice yarn store on Tuesday to buy some rather nice yarn and a pattern, Ohoh I blew the whole budget there, no matter, it’s quality not quantity for this lady. And you will never guess what, but some more rather nice cotton yarn for a rather nice bag just happened to fall into my shopping basket. I think the Gremlin that normally lives in the computer on yarn websites had come with me. Seriously I think I might have yarn buying problem. Is there a self help group for me I wonder. 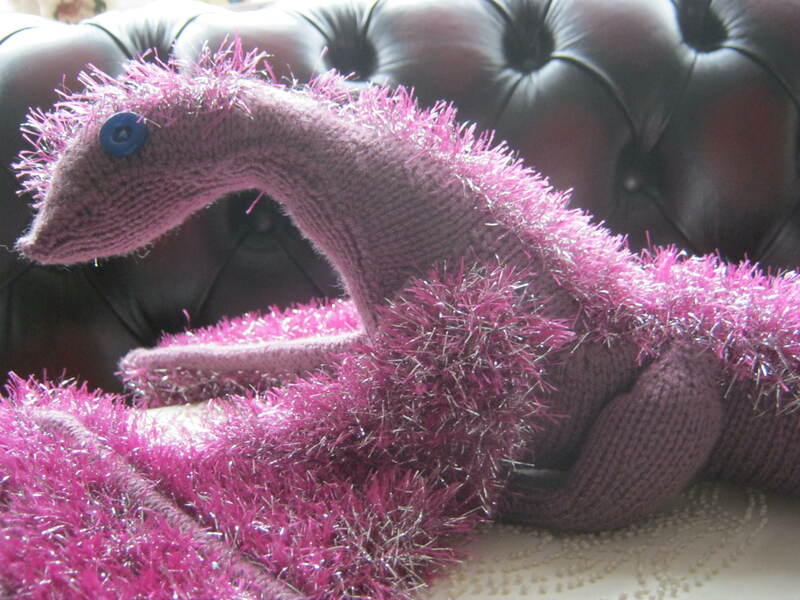 Knitting you ask? Well Secret Santa has been knitting some gloves. I am taking rather a lot of care with these! I have a quiet weekend in front of me. If it stops raining there are still jobs outside to be done, but other than that I foresee some yarn related activities on the horizon. What about you, anything you are really looking forward to , some lovely things on your weekend agenda maybe, please join in I love to chat on Fridays.